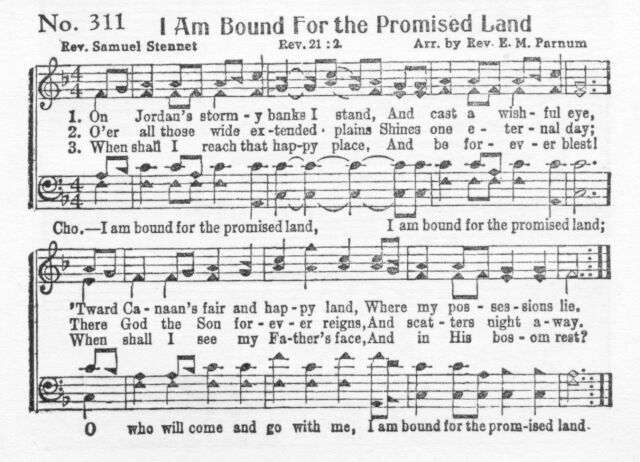 The above version of I Am Bound For The Promised Land was published in Heavenly Highway Hymns, Stamps-Baxter, 1956 edition. The lyrics below are from the Cyber Hymnal. Note that Heavenly Highways credits the arrangement to Rev. E. M. Parnum, rather than Rigdon McCoy McIntosh as in the Cyber Hymnal. I would not say that one version is more "right" than the other, but I think it is safe to say that the version most often sung in rural churches of the Southern United States would be the Heavenly Highways version. I MAY add a Real Audio of this song at a later time.